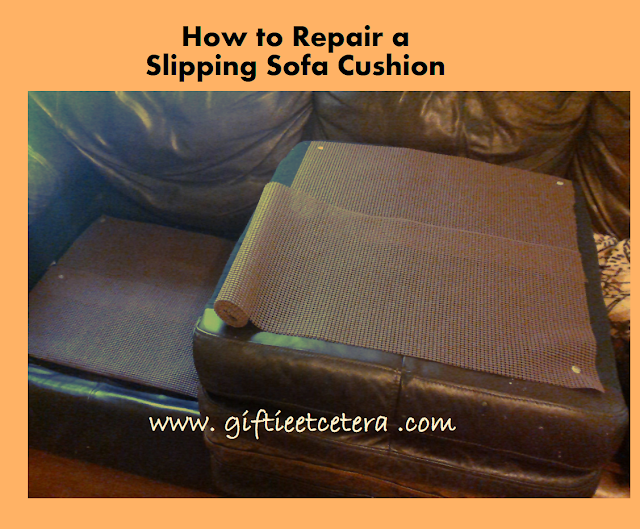 If you have a sofa cushion that keeps slipping, I have a solution. It takes about ten minutes or less, no talent (seriously, I am not crafty or handy at all), and some cheap supplies. 1. Remove the offending sofa cushion from the sofa. 2. Cut two to four pieces of shelf liner in a size that approximately covers the space underneath the sofa cushion AND the underside of the sofa cushion. 3. Use the twist pins at all corners to hold the shelf liner in place. 4. Firmly, without folding the shelf liners (use more pins to keep the liners in place if folding is a problem), place the cushion firmly back into place. That's it. At this point, my simple repair has lasted almost a month with no issues at all. Enjoy your newly functional couch.